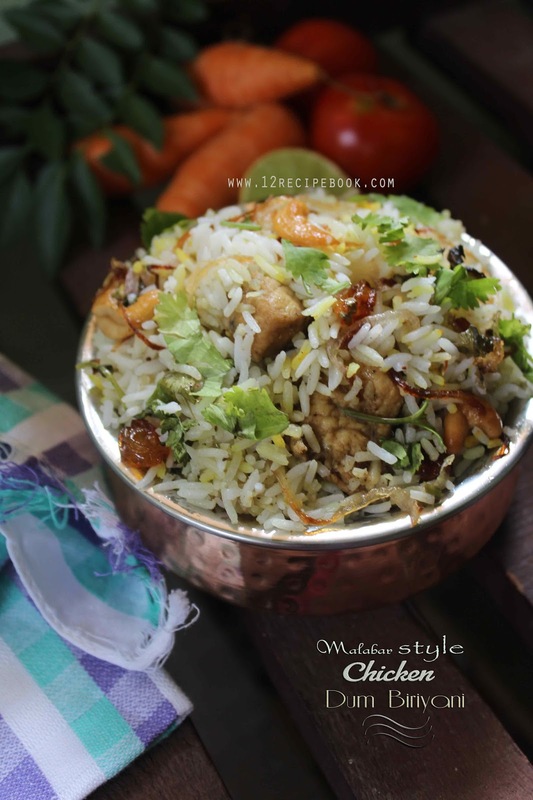 Malabar style dum biriyani is a Popular Rice Recipe. There is no need to explain its taste. 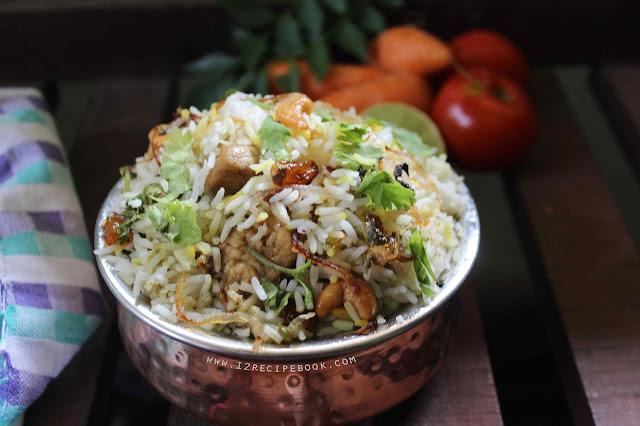 Its loaded with flavors and the preparations are simple. The poppy seeds and cashew paste gives a nice and unique taste for the biriyani. Try this easy recipe and leave your valuable feedback's here. Drain it and cook with enough water by adding whole spices and salt. Drain it and keep aside until the chicken masala gets ready. (or prepare the chicken masala meanwhile cooking rice). Soak poppy seeds and cashews in hot water for 10 minutes. In a blender add poppy seeds and cashew nuts make a fine paste out of it by adding little water. Keep it aside. Heat a pan with oil and fry the garnishing onions, cashe and raisins.Take it out from the pan and keep aside. Now in the same pan add onions for chicken masala and saute until nice goden in colour. Add ginger garli paste and green chilli; saute until raw smell goes off. Add turmeric powder followed by chilly powder, pepper powder, coriander powder and garam masala. Add poppy seeds and cashew paste; mix well. Add curd, coriander leaves, mint leaves and salt. Mix well for two minutes until dried. Add chicken pieces, little more salt and curry leavs. Mix well and cover cooks the pan on low flame for about 20 minutes or until the chicken pieces gets cooked nicely (oftenly open and stir the pan) (The cooking time may took les or more than i mentioned; it depends on the type of chicken and temperature of coking). Mkae the flame to very low. Spread half of the cooked ric eon top of chicken and level it. Sprinkle half of the garnishing ingredoents on top. Add remainig rice and spread the remaining garnishing ingredients. Cover the lid tightly and place a heavy weight on top. Place in simmer for about 20-30 minutes. After that open the lid and give a nice mix. Serve hot with raitha and pickle..